Ok, so you know I love German food! No secret there! And I love potatoes! Big time! In fact, my German family refers to me as a Kartoffelfresser, which loosely translates to: "eater of potatoes". And let me tell you, when you're impressing Germans with the volume of potatoes you can eat, then you are a serious Eater of Potatoes. 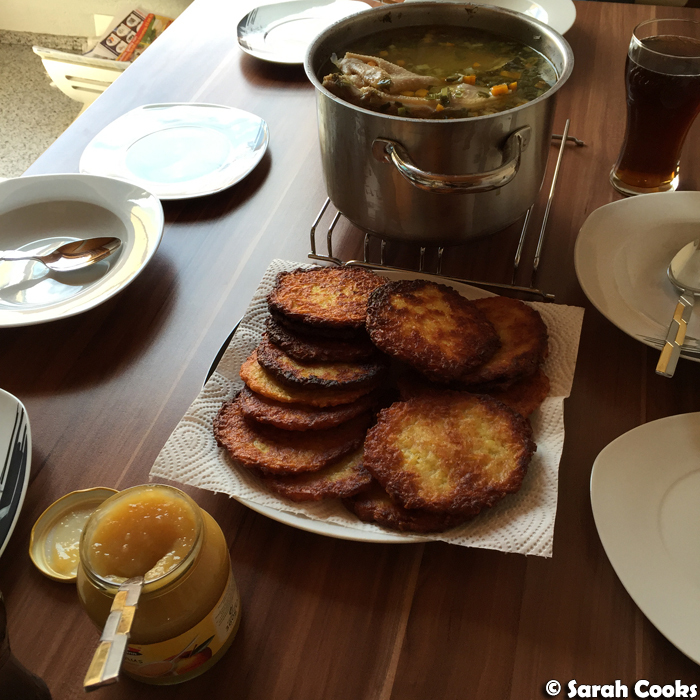 One of my favourite German foods of all time is Kartoffelpuffer - potato pancakes. Basically, they're fritters made of grated potatoes, fried until crisp. 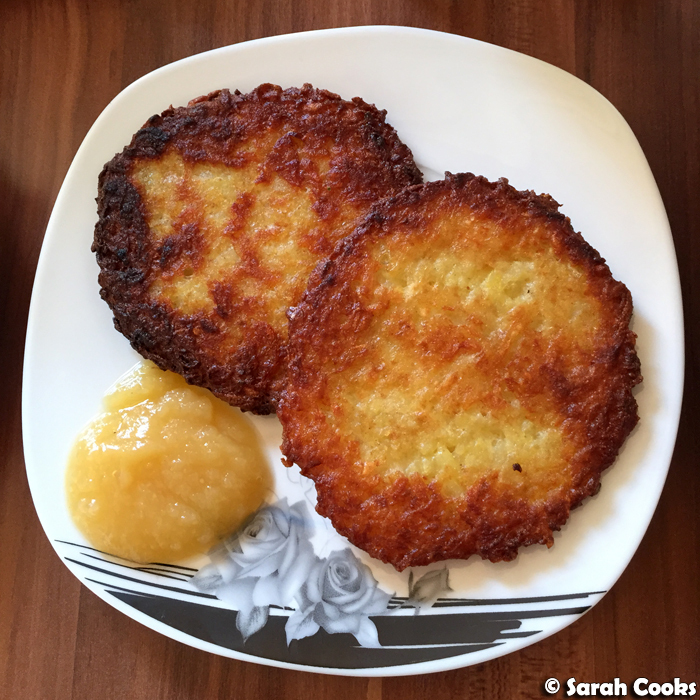 They also go by many different names, depending on what region of Germany you're in: Reibedatschi, Pfannkuchen, Reibekuchen, Kartoffelpfannkuchen, Erdapfelpuffer... (they're also similar to Swiss Rösti or Jewish latkes). So good! Kartoffelpuffer are traditionally served as an accompaniment to soup, usually with apple sauce. Sandra's mum often makes them for lunch while we're in Germany. Here's a couple of pictures from our most recent trips (May 2016 and August 2015). In Germany, good quality packet Kartoffelpuffer are widely available, so Sandra's mum often cooks those. (Which is also why hers are nice and round!) 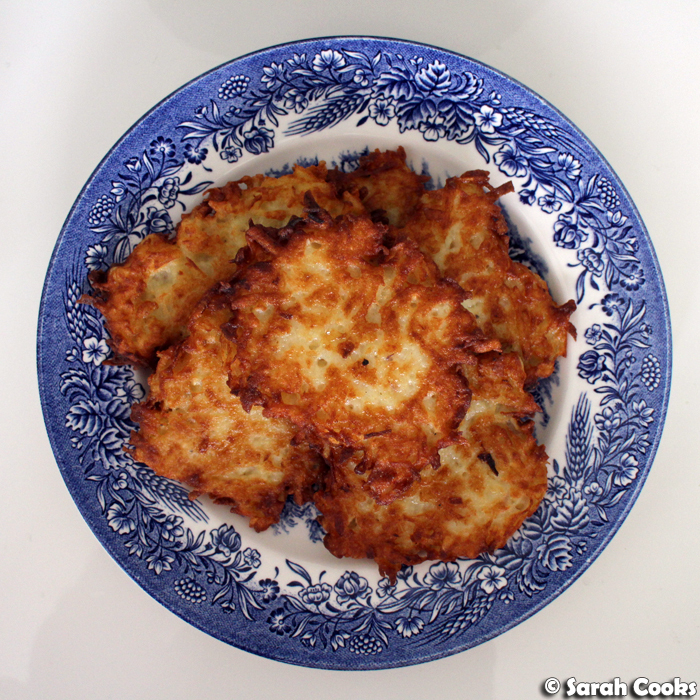 Obviously, packet potato pancakes are a lot less common here in Australia (although I think some German butchers and Continental delis would stock them), so when I want some crunchy potato pancake goodness, I have to make them from scratch! 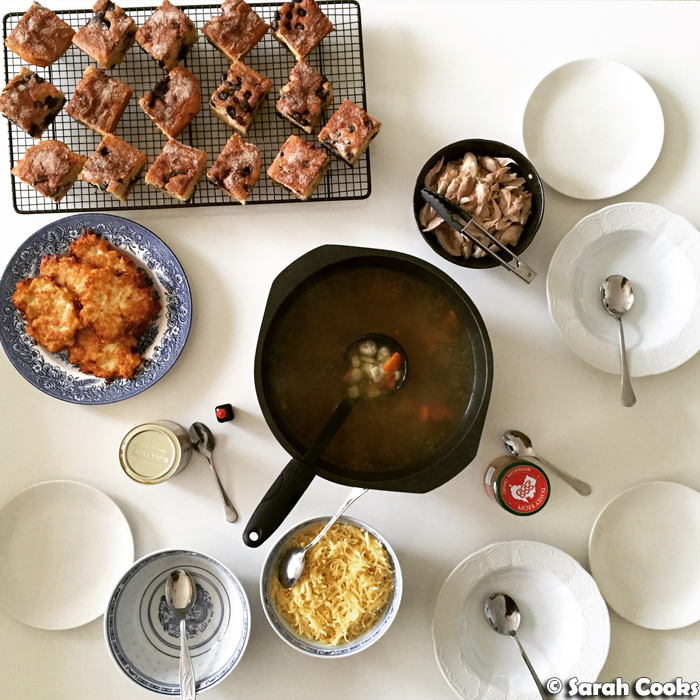 Last weekend, we had our friend Duncan - fluent German and Swedish speaker, excellent baker and all round lovely guy - over for lunch, and thought he would appreciate a homely German meal. 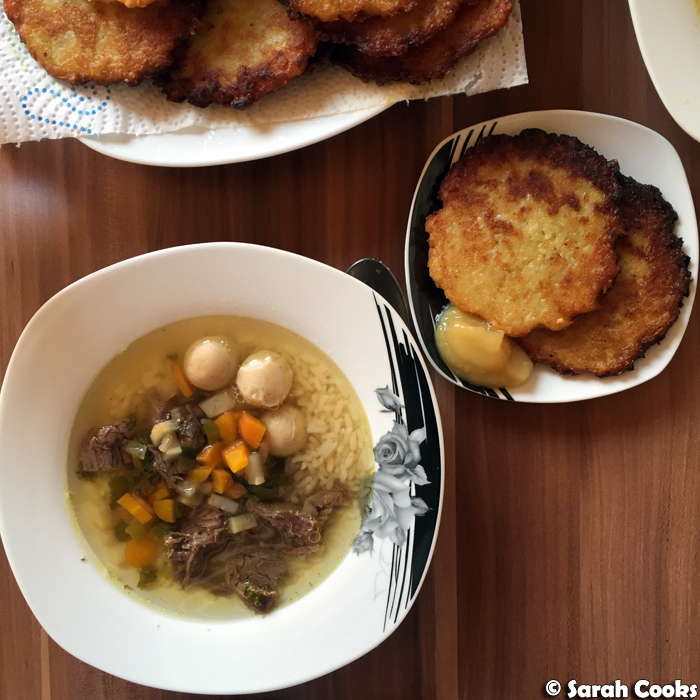 Sandra made a lovely pot of chicken noodle soup (with her amazing homemade Markklößchen - AKA bone marrow dumplings), and I made the Kartoffelpuffer! I'm pleased to say they turned out great, and I thought it was high time I shared the recipe with you. Side note: the cake in the top left corner of the above photo is Smitten Kitchen's blueberry boy bait. It's amazing. Bake it! Back to the Kartoffelpuffer. There's a little work involved in making them, but they're so worth it! You start by grating potatoes. Use a processor if you prefer, but unless I'm grating a huge quantity, I find it a hassle to get the processor out, and washing it is always a pain. I usually grate by hand. 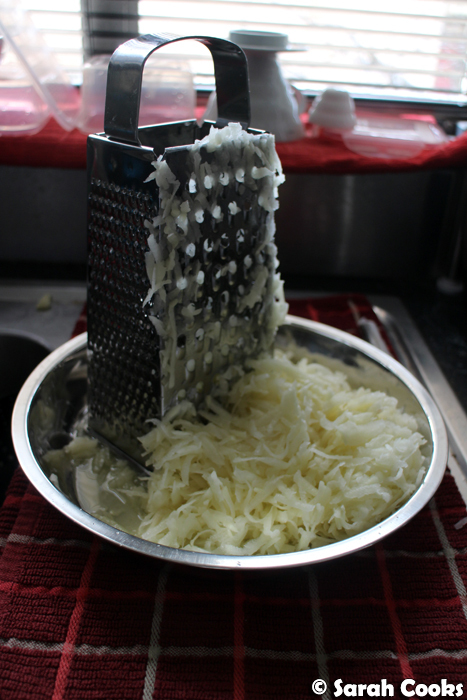 Next, you gotta squeeze as much moisture out of the grated potato as you can! I find a clean teatowel over a sieve works best for this. Then it's simply a matter of adding the remaining ingredients and stirring. For some reason, most recipes I've seen ask for heaps of onion - approx. one onion to four potatoes seems standard. However, I find that this makes the finished product overpoweringly oniony. I usually use just a small amount of onion - about a quarter of an onion to six potatoes is just right for me. I always find frying a little stressful - splashback is a real risk! Just be careful and take it slow. If you can manage to make the patties round - good for you! I usually slowly scoop the mixture into the hot oil, and gently press down with an egg flip to make them flat. Mine tend to be a little uneven, but they always taste great. I mean, how could fried potatoes not taste good? If you want to make them to accompany chicken noodle soup - great! If you just make them for a snack, all crispy and salty and delicious, then I wouldn't blame you. Enjoy! Line a sieve with a clean tea towel. 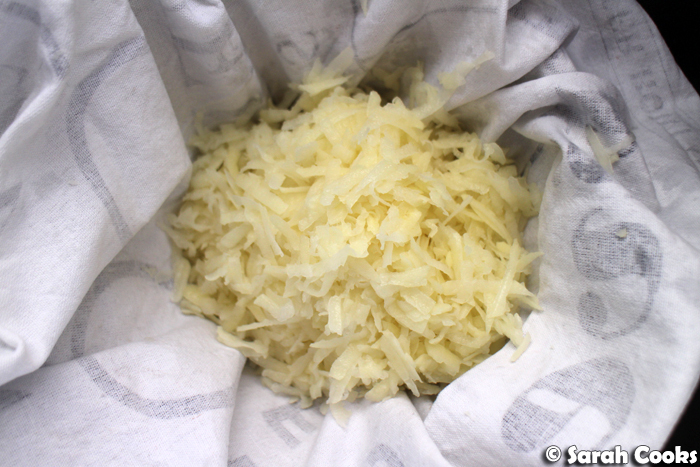 Place the grated potato pieces into the tea towel, and squeeze as much moisture out as you can. 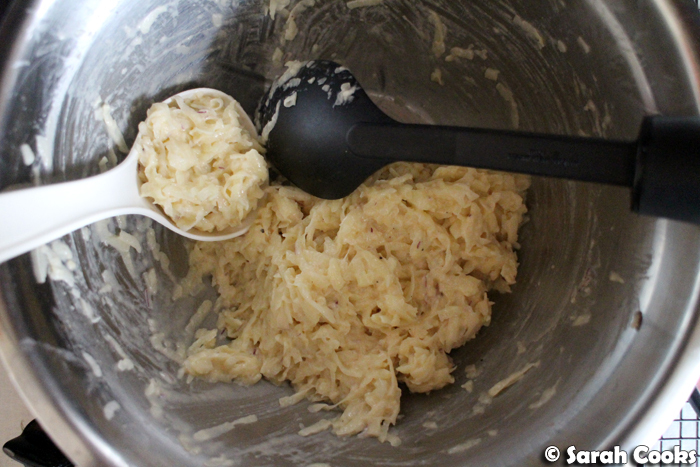 Place the drained grated potato pieces in a mixing bowl. Finely chop the onion and add to the potatoes. 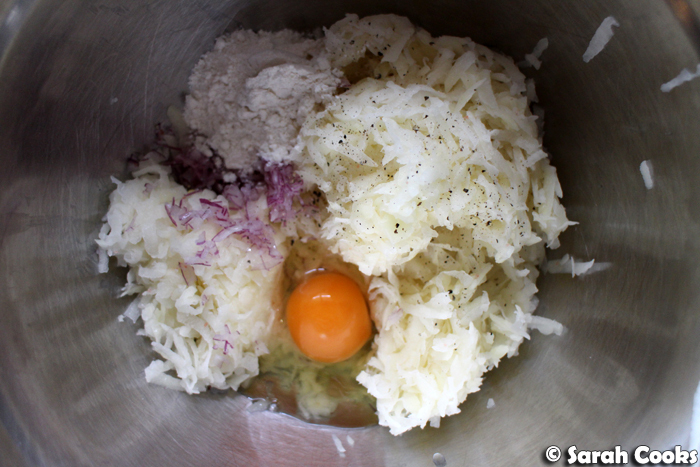 Add the egg and flour, and stir to combine. Add more flour if the mixture is quite liquid. Season generously with salt and a little pepper. Heat half a centimetre of oil in a frying pan. Fry the potato mixture, 1/4 cup at a time. Cook for 2-3 minutes on each side, or until golden brown and cooked through. 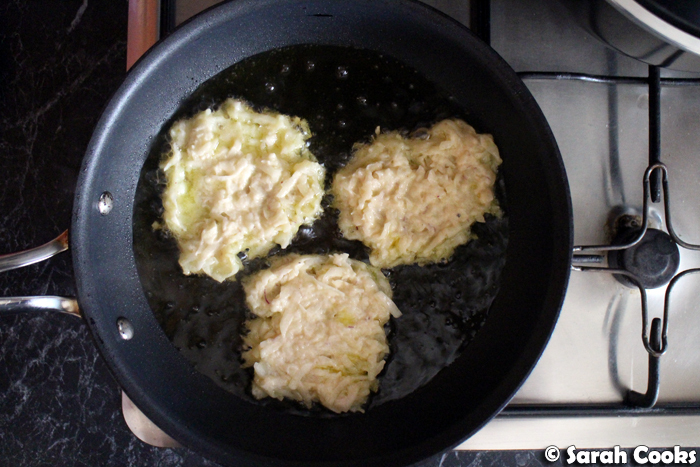 Allow the pancakes to drain on kitchen paper, and continue frying until all the mixture is used up. Sprinkle with more salt to serve. Serve with apple sauce and chicken soup! Makes 9-10 pancakes, serves 3-4, depending on appetite and what you're eating them with. I will definitely love these :D Your photos are making me hungry. I love potatoes too! I might try to make one later. I can't wait! Bahaha I don't think you're the only kartoffelfresser around here! These look amaze! Your pancakes looks crunchy and delicious, Please give me a few now. I am very hungry when look ay them. Potato pancakes is my favourite food . After seeing this I feel hungry . I am gona to make it right now . 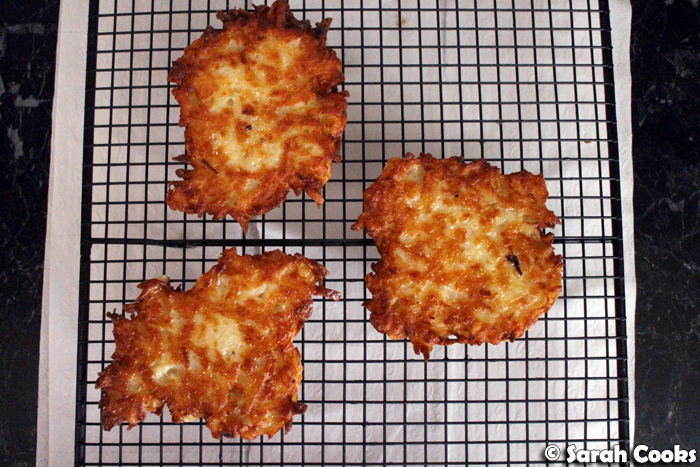 I like latkes and rosti ..Just an awesome food .